It was a quintessential fall day: cool and sunny with color in the trees, bold splashes of yellow and orange lining the banks of the AuSable River. What made it all the more colorful was company I was keeping and the canoes they paddled, each made of wood and rich in history. 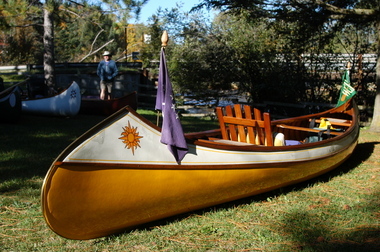 Floating close by was Dave McDaniel in his early 1950s Peterborough canoe, its varnished wood ribs finished bright.